Lightning is probably one of the most familiar electrical charge in clouds. What is not understood very well by the general public is how lightning forms. 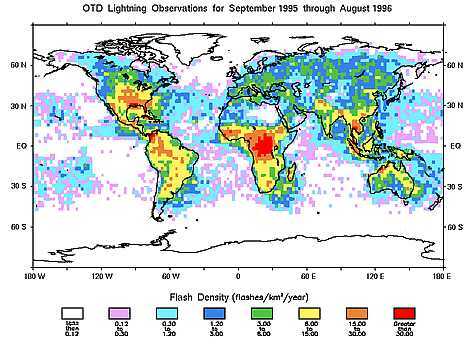 Lightning can be found in almost all parts of the globe as shown in the graphic below courtesy of NASA. Lightning has been a source of fascination and awe throughout history with lightning being featured as the weapons of the gods. While people used to think that lightning had supernatural origins, today we know the scientific causes of lightning. As the particles in a cloud grow and interact with one another, some charging takes place through collisions. The larger particles receive a negative charge while the smaller particles acquire a positive charge. Due to the influences of gravity and the updraft, the two charges tend to become separated. This results with the upper portion of the storm to receive a positive charge and the lower portion of the storm to have a net negative charge. This results in a large potential gradient between the top and the bottom of the cloud. When the electrical resistance of the air breaks down, a bolt of lightning, such as the one below, is released. There are multiple different types of lightning that can be created as shown in the picture below. As the graphic, courtesy of NASA, shows lightning can come in the form of cloud to ground, cloud to cloud, cloud to air, and inter-cloud. The charge separations that cause each type are also shown in the above picture. 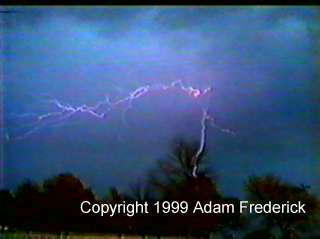 Cloud to ground lightning, like the picture below, is what most people think of when they think of lightning. This is the most visible, most destructive, and most deadly type of lightning. Most of this type of lightning is of a positive charge. It typically occurs during the dissipation of a thunderstorm. Some may be negatively charged. There are theories currently being researched looking at the correlation between negatively charged lightning and tornadoes. 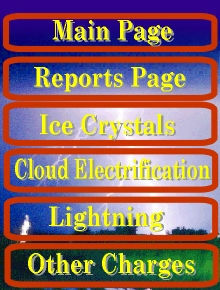 Intra-cloud lightning is the most common type of lightning. This type of lightning occurs between opposite charges that exist in the same cloud. Finally, there are multiple different ways of detecting lightning. 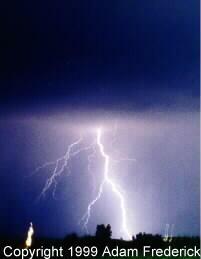 Lightning can be detected by ground based devices. 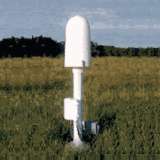 Ground based devices listen for VHF signals consistent with lightning. Below is what one of the ground based sensors looks like. Then by using a network across the country, the strength and time of arrival can be used to triangulate its exact position. Below is a picture showing the location of the sensors across the country. Since it is not always possible to set up lightning sensors across different parts of the world, we have to be able to estimate where lightning strikes are. This can be done by using a satellite. The satellite does not get the resolution, or exact location o f the strike, but it gives scientists and researchers a general idea. Below is what some of the data looks like.